Elizabeth Dumont had thought she would marry. Twice. Both times had come to naught. The first man had left her after scandal rocked her family. The second had been in response to a mail-order bride advertisement, and she had arrived in Little Horn, Texas only to discover her intended was marrying another. And the pastor was none other than Brandon Stillwater, her first fiance. David McKay's abandonment she could accept, he'd tried to reach out to her, but she hadn't learned the truth until too late. After Brandon's abandonment, she could never trust him again. Brandon had been surprised to see Elizabeth in Little Horn. It was so far from the life she had claimed to want. He couldn't understand why she was so upset with him, she treated him as if he were at fault, when she had made the choice. So instead, he focused on the wards she had been hired to care for. The triplets who had been abandoned. It was a temporary arrangement, Elizabeth could only fill in until the orphanage was ready, then a married couple would take the charges. Until then, he would step in and help when he could. It was the civic, and Christian thing to do after all. Elizabeth's standing was tenuous at best. She would soon not have income, and there were few opportunities in the surrounding area. Brandon hoped to find something for her in the community, but there weren't many options for a single woman in their town. She would either have to find a position far away, or marry one of the local bachelors. As he considered her options, he realized none of the other bachelors were good enough for Elizabeth. Only he could fill that role. 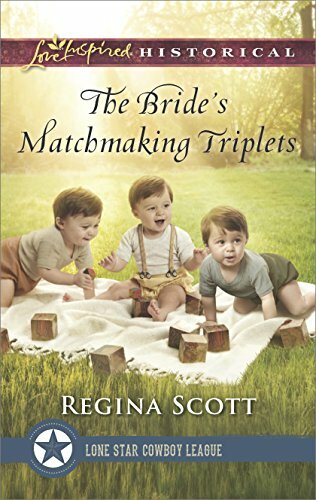 The Bride's Matchmaking Triplets was an enjoyable sweet romance. I have not been reading this continuity series (a series written by multiple authors), but found it very easy to follow the different relationships and conflicts among the Little Horn citizens. Elizabeth was a wonderful heroine, caring for all those around her, and falling in love with the little ones in her care. Brandon was a fine hero, dedicated to his ministry and the welfare of those in the community, but also wanting to help the only woman he had ever loved. It was lovely watching as they overcame the obstacles created in their past to find their happily ever after together.